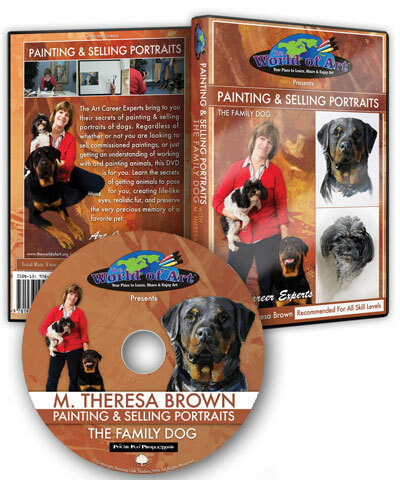 Theresa brings to you her secrets of painting and selling portraits of dogs. Regardless of whether or not you are looking to sell commissioned paintings, or just getting an understanding of working with and painting animals, this DVD is for you. Learn the secrets of getting animals to pose for you, creating life-like eyes, realistic fur, and preserve the very precious memory of a favorite pet." I have been watching your video on The Family Dog and I am truly impressed by how you take us through the process step by step. Now and then you say something like “this also works when painting people.” Do you, by any chance, have a video on portraits? Thank you so much for making the pet video. I can’t wait to try your techniques (I have a cute black & white Havanese). Thank you so much for the delightful lesson on painting dogs. I just loved it and I would come to another one even if it is the same. That was so much fun. Today I started painting our other Yorkie. He has a short hair cut so that may be different but I'm ready to play. I had my husband help me get an outside photo of him this morning without the flash and I watched your DVD to remind me of all your great tips. I love your DVD. Great information and you did not move too fast. It was perfect. I only hope I can learn to paint with more confidence and success. Thank you again. What fun!